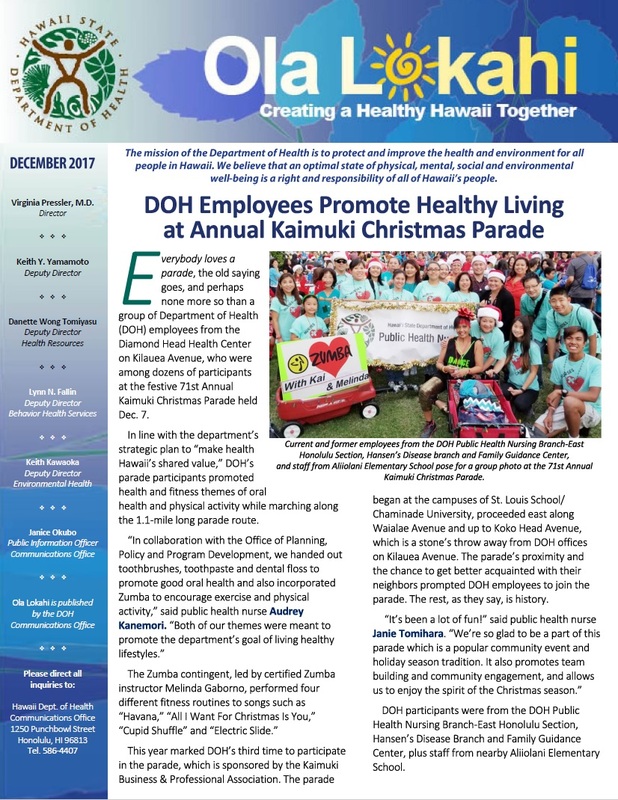 Everybody loves a parade, the old saying goes, and perhaps none more so than a group of Department of Health (DOH) employees from the Diamond Head Health Center on Kilauea Avenue, who were among dozens of participants at the festive 71st Annual Kaimuki Christmas Parade held Dec. 7. Open the attached newsletter pdf to read more. The DOH Chronic Disease Prevention & Health Promotion Division introduced the new Choose Healthy Now @ Home Recipe Book to a live audience during a recent cooking demonstration for the KHON Wake Up 2Day morning show. Open the attached newsletter pdf to read more. With busy schedules and competing priorities, food safety, sometimes takes a back seat during Thanksgiving and at other holiday meals as families prepare to get the food to the table, along with potluck dishes brought by family and friends. Open the attached newsletter pdf to read more.